Fancy A Quad Core Version of the Meizu MX? There are two things I think about when I hear the name Alcatel, cheap and tacky however it seems that they are setting out to change that image (or are they?) with the introduction of the Alcatel Blaze Duo which is a Gingerbread Dual Sim handset. There are two of these on the market, the OT-918N which ucses 850MHz/2100MHz for 3G and OT918D which uses the 900MHz/2100MHz frequencies for 3G. Outside of that they both have quad-band 2G coverage. Sound good so far? Well take a look at these specs, they will change your mind for sure. The coolest thing about this handset is how it uses the Dual Sim – they both go in the same slot. The first one goes face down and the second one goes face up. 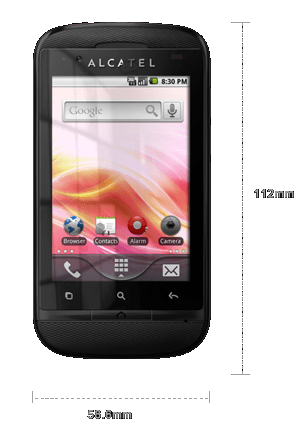 The Blaze Duo OT-918N is available right now in the Philippines 6000 Philippine pesos (about $140/€105). The 918D is available in Australia for $179. does it support multiple touch???? I own one Alcatel OT918D. Yes Alcatel is on the good way to change its image, this smartphone feels good, with a good build quality, and is very complete. As far as i’m concerned, concurrent model with same feature are for times the price asked for this phone.